(In 2007 and 2008 I posted previews for the AAHPM/HPNA Annual Assemblies. I started doing the preview because one of my favorite things about conferences is talking to other people to see what they are interested in, so feel free to comment on which sessions you are excited about. If you are giving any of these talks, I encourage you to leave some comments to get more people aware of your talk. There are some good ones! For the rest of the days of the conference I am not going to mention every single talk but point out what I feel are the highlights of the day, or if I just want to make a silly/witty/whatever comment on a particular title. For a good exercise in appreciating the different challenges palliative care faces, try thinking outside your own institution and the cries of 'how come the oncologists don't refer to us?' or 'We need another social worker and nurse to truly do great palliative care.' Instead imagine trying to do palliative care in a country that may not have ready access to opioids or inpatient hospice units. The African continent has two prominent groups supporting palliative care growth: Foundation for Hospices in Sub-Saharan Africa (FHSSA) and The African Palliative Care Association, which will be featured in the first half of the opening plenary. 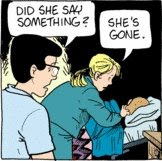 Tom Batiuk is the comic strip creator of Funky Winkerbean and is best known in medical circles for occasionally featuring his characters taking on tough real life issues such as: teen pregnancy, depression, dyslexia, and alcoholism among others. His best known topical work is about a character named Lisa who develops breast cancer and whose storyline has been compiled into two books: Lisa's Story and Lisa's Story: The Other Shoe. The National Consensus Project is a huge undertaking by the AAHPM, HPNA, CAPC and the NHPCO to develop guidelines for Quality Palliative Care programs. Anyone who is starting a program or currently working with one should be familiar with these guidelines and the eight domains covered. I am not sure what will be covered during this session: a review of the project, a discussion on implementation, a look forward at how these guidelines will be incorporated into organizational/accrediting policies. Regardless, the project is a structural cornerstone for organizing palliative care services. Excellent topic that is the cause of many discussions in a hospice team meeting. How best to stop or taper insulin regimens? How to commend the years of exactitude in controlling blood sugars and at the same time inform a patient that it doesn't matter anymore? I am not aware of any key articles covering this topic so I hope these presenters point us to some good literature or maybe codify their talk into an article! Obviously Dr. Abernethy, the editor of PC-FACS, is well-heeled in evidence based medicine as she has much to draw from with this talk. How to cram or connect EBM and research challenges is a tall order for a talk and I am curious of the angle the speakers will take. Will it be about extrapolating research on non-dying patients, like I had to do for a recent talk about managing thromboembolic risk in palliative care patients? Does it echo similar themes from the above diabetes talk? I am excited to see! Self-care? How do I know thee? Let me count the ways. I hope this talk goes beyond the classics of self-care such as taking time for oneself and talking with other peers about the stress. Self-care covers so many constructive and destructive activities/thoughts and has many cultural, professional and gender influences. I enjoy talking with my colleagues about things they do to recharge because it gives me new ideas and lets me get to know the people I get to work with. BriefPal. Clever nickname. The emergency department is an area with a great need for rapid response palliative care. Some of the difficulty may come in staffing a service 24hrs, but even if you had ready phone consultation and pallaitive care admitting privilages you could quickly make some new friends in the emergency department. If you have never gone to the business meeting for the AAHPM, I highly recommend it. It does have potential to be a little dry with all the financial info, but it is a good way to get a feel for how our field is moving and to understand where all your dues go! I want to know how Diane Meier does it. Her brain has to be huge or maybe she just switches one out when she needs to know a different topic. CAPC, Medicare, Professor, Director of a Palliative Care Service. No wonder she received a MacArthur Genius Grant. I hope she gets some standing ovation for that. If you go tyo any of her talks this year, please stand up and mention this during the Q&A session so everyone can show her some appreciation for her outstanding contributions to the field. Oh and this topic is going to be VERY VERY IMPORTANT! Does Breathing Equal Living? When Does Respiratory Care Become End-of-Life Care for Children and Adults with Neurodevelopmental Impairment? Provocative title! I wish there was more extension of palliative care philosophy into pediatric and especially neonatal fields. This is an area of great need but may have cultural challenges preventing deeper penetration, much more difficult then partnering with oncology or ICU's. Support your local pediatric palliative care and hospice programs! AAHPM/HPNA Annual Assembly Preview: Wed Pre-Conf.